The Ethiopian government on Friday denied reports about the defection of four Air Force pilots to neighboring Kenya. "This report is a baseless fabrication," Ewnetu Blata, State Minister of Government Communication Affairs Office, told The Anadolu Agency. "I can confirm that the report is untrue," Ewnetu said. Media reports alleged that four pilots in an airbase in eastern Ethiopia had defected to Kenya. Last week, the Ethiopian Defense Ministry accused Eritrea of hijacking an Ethiopian helicopter. 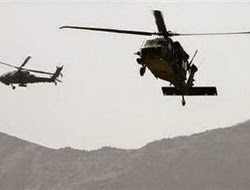 The ministry said in a statement that an Ethiopian helicopter – that has disappeared since Friday – was forced to land in neighboring Eritrea. It said the helicopter was on a training mission when the Ethiopian pilot forced a trainee and a technician on board to head to Eritrea.